October home sales continued their upward momentum, up 5.50 % compared to a robust October a year ago. 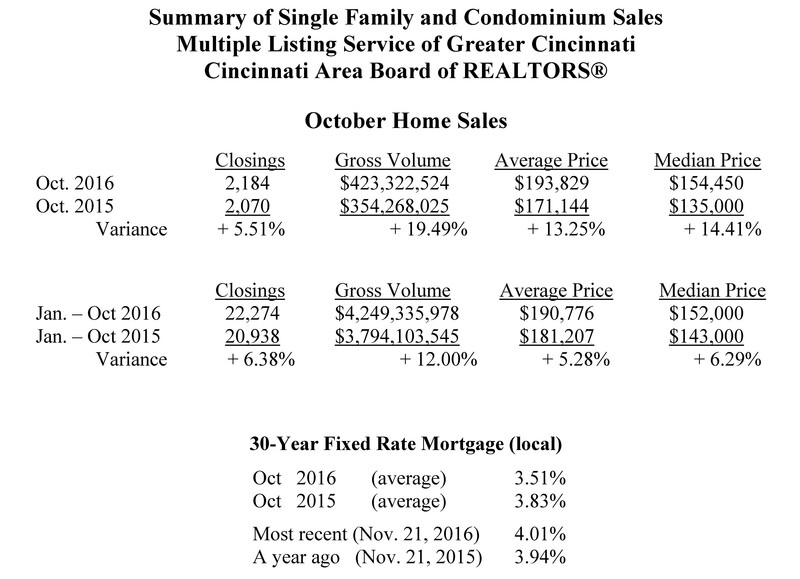 Home sales this month were 2,184 compared to 2,070 in October 2015. For the first ten months of 2016, home sales are up almost 6.4% over the first ten months of 2015. “Greater Cincinnati is a very stable and affordable market for purchasing a home,” said Patti Stehlin, President of the Cincinnati Area Board of REALTORS®. “Currently, the market is so strong that we could achieve all-time highs in sales as well as in average and median sales prices,” said Stehlin. The average home price climbed to $193,829 compared to $171,144 a year earlier, a + 13.25 % increase. At the same time, the inventory of homes for sale, as of October 31, continued its year-over-year declining trend to 6,244 from 8,031 a year ago, down – 22.25 %. “Our average price of homes has been at record highs the past five months. Our low inventory coupled with low interest rates and consumers ready to purchase make this a very active market that continues to drive the prices higher. Remember, homes that are priced right and that are in move-in ready condition are the properties that are selling quickly,” said Stehlin. Local home mortgage rates in October averaged 3.51% for a 30-year fixed rate loan. The rates were higher at 3.83% a year ago. At these fixed rates, the monthly principal and interest payment on a $100,000 home loan with no money down would be approximately $450. Nationwide, October home sales were up + 2.0 % from September on a seasonally adjusted basis, and were up + 5.9 % from October 2015.